Fort Knox, the Home of Mounted Warfare, has served as a US military installation since 1918. During this time it has played a key role in the development of military tactics, doctrine, and equipment, and has performed an integral part of the training for the active Army and Army Reserve. 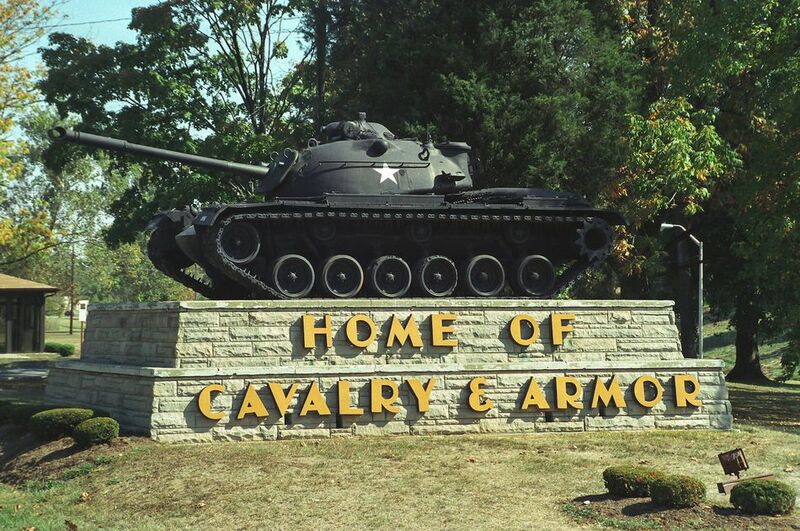 Every soldier in the armor force has served here at least once during his term of service, whether in the permanent garrison or in the initial entry training, in one of the noncommissioned officer courses or in one of the armor officer training courses. The post also hosts nearly 400,000 visitors annually at the showcase of the armor force and Fort Knox history, the Patton Museum of Cavalry and Armor. Fort Knox is a U.S. Army Training and Doctrine Command installation with the primary mission of training soldiers for the Armor Force. The Armor School is the rock on which the Armor Center mission is built. It is also home to the U.S. Army Recruiting Command and the 2d Region ROTC and Readiness Group Knox. The most well-known landmark at Fort Knox is the U.S. Bullion Depository, better known as the Gold Vault. The Army Accessions Command has personnel on post and will relocate the headquarters here as a result of the BRAC decisions of 2005. Fort Knox is a certified Kentucky city, covering 170.4 square miles. It is the seventh largest urban community in the Commonwealth of Kentucky. Fort Knox is adjacent to the city of Radcliff, Kentucky, 15 miles north of Elizabethtown, and approximately 45 miles south of Louisville. Fort Knox covers parts of Bullitt, Hardin, and Meade counties. The installation adjoins the Ohio River and is drained by the Salt River and its tributary, the Rolling Fork. The western third of Fort Knox has good road accessibility, but there is only limited gravel road access to the northern and southern training areas. Take I-65 South to the Gene Snyder Freeway West (KY 841) until you reach the 31W Fort Knox exit. 31W will take you to the entrance gates of Fort Knox. This is approximately a 30-minute ride. To reach In/Out Processing (White Hall, Bldg 1384 Chaffee Avenue), take the Bullion entrance and follow the In/Out processing Center signs. In/out processing will be the first building on your right just before you reach the traffic circle. Take I-65 North to Elizabethtown. You will exit on Hwy 62 Mulberry Street exit. You will turn right onto Ring Road to 31W, Dixie Hwy. Fort Knox is approximately 15 miles north. You will travel through the town of Radcliff in doing this. You will reach the first Fort Knox entrance Bullion, which is open 24-hours. The 2nd entrance would be Brandenburg entrance to Fort Knox. You will have to take a taxi from the airport (502-351-TAXI, 502-352-0619, 502-352-0163)to Fort Knox. There is no Fort Knox shuttle to and from the airport. Fort Knox has a population of over 23,000 Soldiers, family members, and civilians. Major units at Fort Knox include 16th Cavalry Regiment, 194th Armored Brigade, 46th Adjutant General Battalion, 113th Band, 34th Military Police, Detachment 19th Engineer Battalion and Ireland Army Community Hospital MEDDAC. Fort Knox Army Lodging has over 600 transient lodging rooms located in six standard guest room complexes throughout Fort Knox. Units are standard style efficiency apartments complete with queen-size beds, microwaves, cooking facilities, refrigerators, cable television, VCRs, and free in-room internet access. For reservations call (502) 943-1000. Reservations are accepted 120 days in advance for official travel and 14 days in advance for unofficial guests. Families attending Basic Training graduations or Family Days may reserve 14 days in advance of graduation or Family Day date. Credit card guarantee is required for late arrivals. A limited number of pet rooms are available. Pets must have a health certificate and there are a non-refundable $40.00 cleaning fee and a $6.00 daily pet fee. Geographical Bachelors Quarters is a facility for "geographical bachelors", assigned to Fort Knox, KY. The GBQ maintains a full roster of occupants as well as an extensive waiting list of personnel desiring to take advantage of quality, affordable housing. Personnel will be placed on the waiting list by date of eligibility if the application is made within 30 days of arrival at the new duty station. If not, eligibility date is the date of application. Key and essential personnel will be placed at the top of the list immediately below other key and essential personnel. Contact the GBQ at (502) 943-1827. Camp Carlson is a scenic outdoor recreational camping area. The camp features an Army Travel Camp with water, electricity, toilets, showers, laundry facilities, and a sewage dump station. Both trailer and tent camping are permitted. Reservations are required for everything except recreation vehicle sites and tent camping. Individuals who rent their camper or tent from the Fort Knox Rental Center receive a 10% discount per night on their vehicle/tent site. Knox Hills LLC owns, operates and maintains all family housing on-post. Please visit the website or call the leasing office at 502-799-6550. To apply in advance for housing, you may fax your orders to 502-799-6550 along with a marriage certificate (if applicable) and birth certificates of each child (if applicable). Also, include your date of rank and date of birth (service member). When you arrive at Fort Knox, go to the go to the Knox Hills Leasing Office located at 41 W. Chaffee Ave. to be assisted with your housing needs. The RCI Office is located in Building 1110B, 3rd floor, Room 325. The phone number is 502-624-7009, fax 502-624-7104. The Housing Service office (HSO) can help you choose: Temporary lodging, a permanent home - rental or purchase, whether to buy a home, and how to go about it, and money and time-saving ideas for your move. They are located in the Knox Hills Leasing Office at 41 W. Chaffee Ave. You can contact them at 502-624-3548/5824; fax 502-624-4089. Fort Knox Community Schools system operates four elementary schools with grades preK-3, two intermediate schools with grades 4-6, one middle school with grades 7-8, and the high school with grades 9-12. Enrollment totals approximately 2,000 students. Established in 1932, the Fort Knox Community Schools provide a comprehensive program for preschool through high school students who are military family members living on post. Approximately 2,800 students attend the eight Fort Knox schools, which are accredited by the Southern Association of Colleges and Schools. Fort Knox schools provide full educational benefits for children with special needs, ages three through 21. The system offers special programs for students with a wide range of disabling conditions; including mental handicaps, emotional disturbances, and learning disabilities. The school system makes contract tuition arrangements for students with special problems that are beyond the scope of the system's facilities or personnel. Fort Knox Schools' voluntary half-day program for four-year-olds is called the Discovery Program. The program uses a Montessori-based curriculum. If you have a four-year-old, it is highly recommended that you enroll. The School Liaison Officer works in conjunction with Child and Youth Services and the local school community to address educational issues including, homeschool involving military children. For more information, contact your School Liaison Officer at 502-624-2305 or DSN 312 -464-2305. For adult education, there is a community college and a vo-tech school in Elizabethtown, as well as branches of large universities on post. The main campus of the University of Louisville is a 45-minute drive from the base. Child care at Fort Knox is offered in the Child Development Centers, Family Child Care Homes and through the School Age Services Program. The Fort Knox Child Development Centers are located in Buildings 4250 and 4249 and can be reached at 502-624-6700 or DSN 312-464-6700. The CDCs care for children 6 weeks to Kindergarten. You must have an appointment for registration and there may be a wait of up to 10 days for an appointment. The registration number is 502-624-6703 or DSN 312-464-6703. Family Child Care is in-home certified care that is provided by a family member in government quarters. Providers are private contractors who establish their own fees and operating hours. You may contact the FCC office Monday through Friday, 7:30 am until 4:30 pm at 502-624-6702 or DSN 312-464-6707. School Age Services serves children 6 to 10 years of age for before and after school care and full day care during school vacations and breaks. Transportation is provided to and from Fort Knox schools only. Also included in this program is a computer lab, a homework center, and neighborhood activity homes. The Fort Knox Medical Department Activity, MEDDAC consists of Ireland Army Hospital, three Army Health clinics, Nelson Troop Medical Clinic, Camp Memorial Blood Center and a Preventive Medicine Service and Optical Fabrication Lab. MEDDAC serves the active duty and retired members of the armed services, their family members and the family members of deceased service members. It also treats civilians in emergency situations when it is the closest hospital. All patients must present an identification card. Children over 10 years of age must present their ID card even when accompanied by a parent with identification. Patients must be enrolled in the Defense Eligibility Enrollment Reporting Systems. Ireland Army Hospital is a full service general medical and surgical hospital fully accredited by the Joint Commission on Accreditation of Healthcare Organizations. Active duty personnel are required to in the process through the TRICARE Service Center to be assigned a Primary Care Manager. Family members will also receive information on the availability of Primary Care Managers at the TRICARE Service Center. The Community Health Nurse provides comprehensive care and follow-up nursing service for beneficiaries. Services provided include home visits on and off post, chronic disease, and tuberculosis prevention, health and troop education, health risk appraisals, and follow-up on selected communicable diseases.